Adrian graduated from the University of Manchester with a degree in Physiotherapy in 1993. 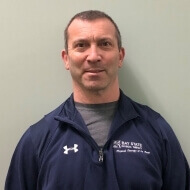 He has worked as a physical therapist in the Plymouth / Carver area since 1994 and for Bay State Physical Therapy since 2000. He enjoys all areas of orthopedic physical therapy, specializing in the McKenzie approach to back pain and the treatment of sports injuries. He draws on his experience as a successful competitive weightlifter for advanced strength training and conditioning. Adrian has a background in research, including a PhD in genetics prior to becoming a physical therapist.